Bob accepted the challenge from Apple CEO Tim Cook and named three familiar characters—Olivia Pope (ABC’s Scandal), Peter Quill (Marvel’s Guardians of the Galaxy) and Tony Stark (aka Iron Man)—to take the challenge. RDJ challenges Vincent D’onofrio,his son, and Chris Hemsworth. Tom nominates Benedict Cumberbatch and Luke Evans. “@NightmareJess: @NathanFillion why did you pick @twhiddleston?” I did that for the ladies. You’re welcome. 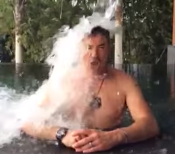 I completed the #ALSicebucketchallenge laid down to me by @DaveBautista & @mikaelahoover. Will post later!